How to authenticate your email domain. 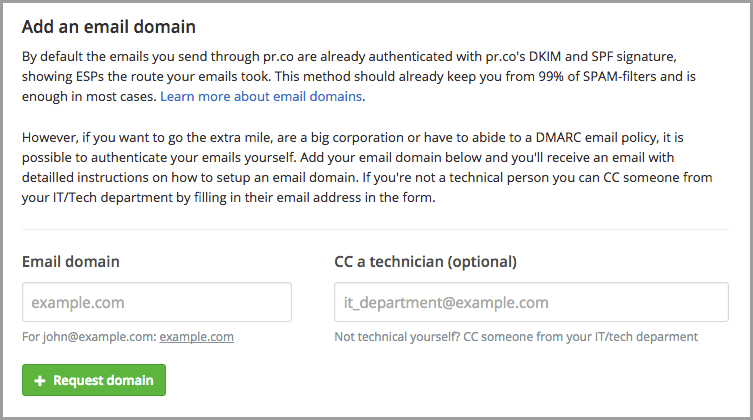 Everything you need to know on authenticating your email domain in pr.co, to ensure the highest deliverability of your emails. It is very important that you are using the appropriate authentication methods with your email. If you are not authenticating your emails properly, ESPs (email service providers) will assume you are spamming and will filter or just drop your email. As soon as you start sending more than a few personal emails it is advised to start signing your emails with DKIM and SPF. Email service providers like Gmail or Outlook already sign your emails by default but if you're using a company email server this might not be the case. By default the emails you send through pr.co are already authenticated with pr.co's DKIM and SPF signature, showing ESPs the route your emails took. This method should already keep you from 99% of SPAM-filters and is enough in most cases, especially if don't send that many emails (less than 5000 emails a month). So if you don't experience any problems, like people reporting that your email ended up in their spam folder, this action might not be absolutely necessary. However, authenticating your email domain's definitely won't hurt. However, if you want to go the extra mile, are a big corporation, need to abide to a DMARC email policy, or simply send a lot of emails, it is possible to authenticate your emails yourself. Here you can fill-in the email domain you want to distribute campaigns with. If you're not a technical person, or don't have access to your domain DNS settings, you can CC someone from your IT/Tech department by filling in their email address in the form. After adding your email domain in the form you will receive an email with detailed instructions on how to setup your email domain. The email will instruct you to add three DNS records to your domain settings: SPF, DKIM and a tracking CNAME. We use Mailgun as our email service provider and we will generate a dedicated set of DNS records just for your domain. Add these DNS records to your domain and wait for another email from pr.co to confirm that everything is set up correctly. This process could take up to 48 hours so please remain calm if it takes a while. Once you've received the confirmation email, your email domain authentication will be active and you will be sending self-signed distribution emails! If you don't receive a confirmation email, have absolutely no idea what DNS records are or don't know what any of this means please shoot us an email with your questions at hello@pr.co.